In order to provide our passengers with the best service, Air Europa has launched new educational content in English specifically designed for the little ones. This new feature is available on all long-haul flights for children aged 2-8 years and is provided by Lingokids, the leading platform for learning English at a young age. It has been developped by leading experts and supported by Oxford University, and counts with 50 animated songs and a large variety of videos in English that contribute towards the learning of a new language, making the flying experience more comfortable and fun for children. This new content can be accessed via the new Streaming Service, which is available in every Air Europa flight. Passengers can also choose from a large selection of thematic channels, movies, documentaries and games completely free of charge. This service is available both on the passenger’s personal devices and the aircraft’s individual screen and iPads in Business Class. Sandra Lenis, Air Europa’s Product and Customer Director, is convinced that this new initiative is a very positive one, as with it, “our company is reasserting its commitment to providing passengers with high quality services. We want to ensure that our passengers enjoy the most comfortable and unique flying experience with the best on-board entertainment”. 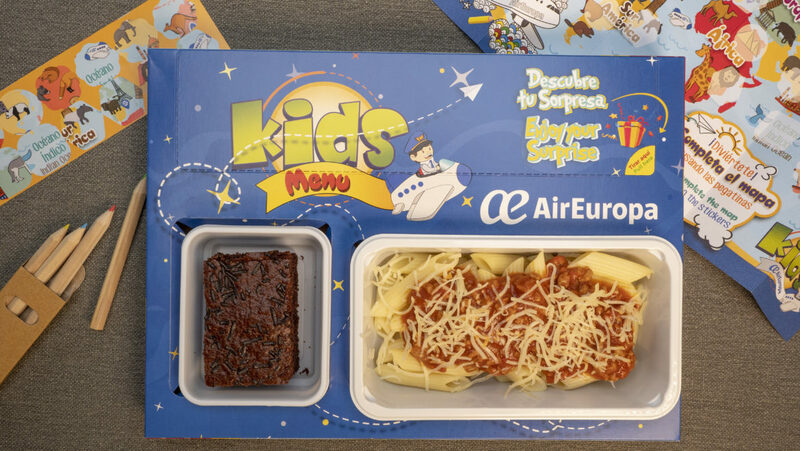 Another innovation introduced by Air Europa this July is the new children’s menu: it is served in a new and fun packaging, which consists of a cardboard tray with multiple compartments. 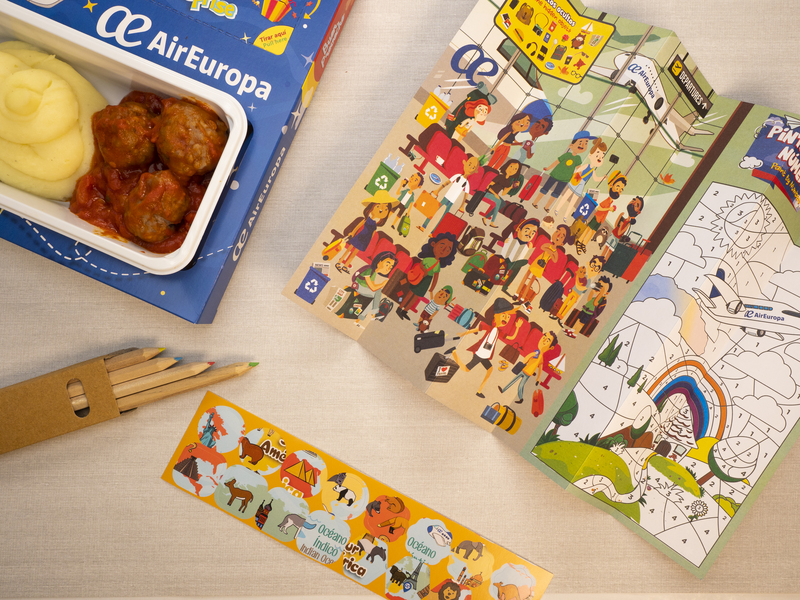 It doesn’t only contain food, but also some stickers, a sheet of paper and a box of coloured pencils in order to make the flying experience more entertaining for our youngest passengers. 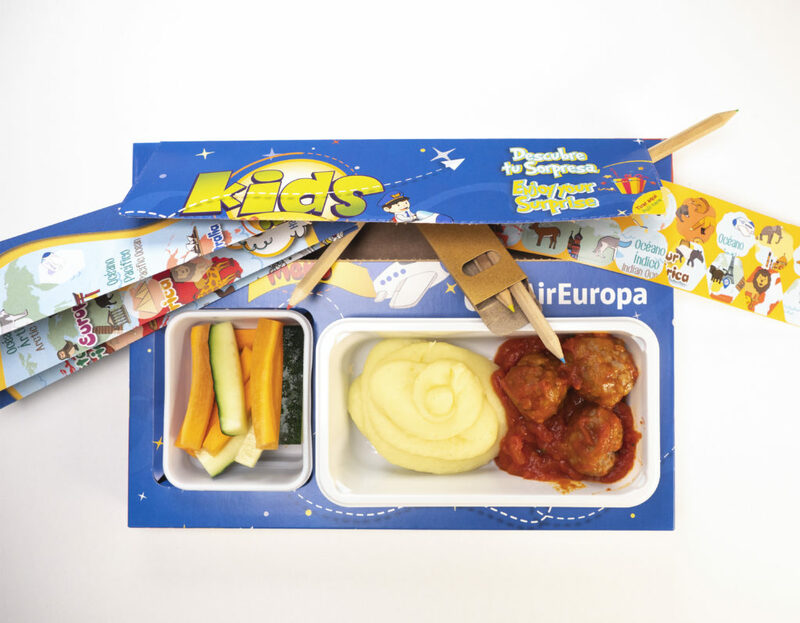 Children can now enjoy a balanced and healthy meal while having fun with our new Kids Menu, which are served completely free of charge on all our long-haul flights originating from Madrid, and on short-haul Business Class flights. It is available upon request and can be requested via our Customer Service department (+44 871 4230 717) or through the Travel Agency where the booking was made. For further details, you can also check our posts on flying with babies and on-board entertainment.